An authentic guide to the festive, mouthwatering sweets of Southern Italy, including regional specialties that are virtually unknown in this country as well as variations on more popular desserts such as cannoli, biscotti, and gelato. 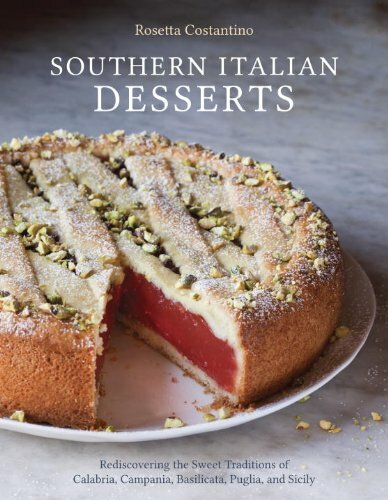 As a follow-up to her acclaimed My Calabria, Rosetta Costantino collects 75 favorite desserts from her Southern Italian homeland, including the regions of Basilicata, Calabria, Campania, Puglia, and Sicily. These areas have a history of rich traditions and tasty, beautiful desserts, many of them tied to holidays and festivals. For example, in the Cosenza region of Calabria, Christmas means plates piled with grispelle (warm fritters drizzled with local honey) and pitta ‘mpigliata (pastries filled with walnuts, raisins, and cinnamon). For the feast of Carnevale, Southern Italians celebrate with bugie (“liars”)–sweet fried dough dusted in powdered sugar, meant to tattle on those who sneak off with them by leaving a wispy trail of sugar. With fail-proof recipes and information on the desserts’ cultural origins and context, Costantino illuminates the previously unexplored confectionary traditions of this enchanting region.